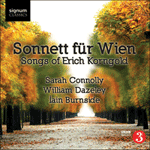 A eulogy to the lost world of pre-First World War Vienna, the Sonnett für Wien is Korngold’s last song, dating from 1953. Its theme is a resetting in basically duple time of the soaring waltz tune that graced the score of a movie entitled Escape Me Never, with which ‘turkey’ of a film it had vanished too quickly. The words are an unpublished sonnet by Hans Kaltneker, the poet who had penned the play on which Korngold’s biggest opera, Das Wunder der Heliane, was based. By 1953 Vienna was a shadow of its former self; there, on his short-lived return in 1950, Korngold, formerly such a celebrity, met with little other than cold shoulders. von ihrer hohen Form, zu Glanz erstarrten! die über hohen Prozessionen schweben! strahlt, von Wehmut sanft befeuchtet. by their stance in frozen radiance. radiates a gentle, tear-stained melancholy.